This project is a great example of doing a lot more with less. Our clients approached us with a single storey brick veneer home with poor comfort levels and natural light, terrible functionality, and barely enough room for their needs. Instead of starting from scratch on a rebuild, we decided to not only make the most of the existing home but to reinvent the streetscape character. Our scheme includes a second storey addition cleverly mirroring the ground floor footprint of the original house. This first floor extension has sweeping views through the suburb and tree canopy and is built with traditional framing systems to keep the home simple and light-weight to meet readily available construction skill sets (to save on costs). A diverse mix of sustainable timbers were used throughout the interior and exterior of this project to connect it with the natural environment. Species were selected for their suitability of use, and simply finished to respect their inherent natural warmth and texture. The home features polished plywood floors, a recycled timber stair balustrade, and generous open plan living space with clever integrated floor storage boxes. The upgrading of the existing walls and floors has created a well insulated and comfortable family home. 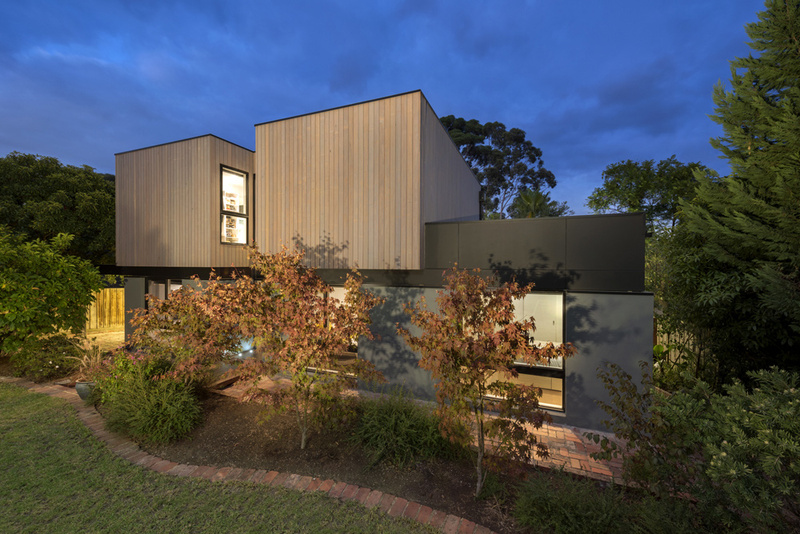 The result is a contemporary, dramatic form in blackbutt timber cladding, which reconnects the home with its tree-lined street and has been successful in reinvigorating the clients’ love for their home. Winner, Residential Design – Alterations and Addition Award, Master Builders Association Awards, Victoria, 2016. Commendation, Residential Design – Alterations and Addition Award, Building Designers Association of Victoria, 2016.